At the 15th annual Can Do Kids Fair last Saturday afternoon, nearly 200 children aged 3–11 walked with their parents the three floors of PEP’s building, stopping to try their hand at roughly 20 activity stations grouped by themes including Carpentry, Bike Maintenance, People Skills, Good Eats, Home Creating, Plumbing, Gardening and several others. Children learned to do—and did—useful, necessary and fun tasks that we adults often consider to be “adult” work, including vacuuming, polishing a mirror, working in a team to clean an entire room, practicing table manners and apologies, machine-sewing a head warmer, hand-sewing a button, clearing a clogged drain, planting vegetables, painting walls, sawing wood and making fruit smoothies, sushi rolls and homemade applesauce. During the fair, Barbara Fairfield, an Adlerian psychologist and moderator of many of PEP’s Open Forum Counseling sessions, interviewed children as they traveled between activities, asking them for feedback on their experiences. Several commented on the joy of learning something new and useful. “I did not know how to make sushi before I came today, and it’s my favorite food!” —Emerson, 10. Barbara adds that Emerson’s mother was glad for that skill, too, since sushi is a pricey item. Other children focused on the fun of the activities and, often, their pleasure in the results of their work. Several children also grappled with the complexities of people skills (one of the activity themes), including working with others. And, children at the fair showed their capacity to accept the pain along with the joys of life’s tasks and their resilience when things were hard. 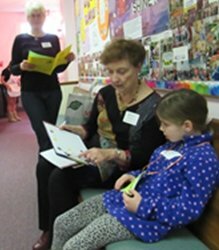 Photo above: Barbara Fairfield interviews a child at the Can Do Kids Fair last Saturday. 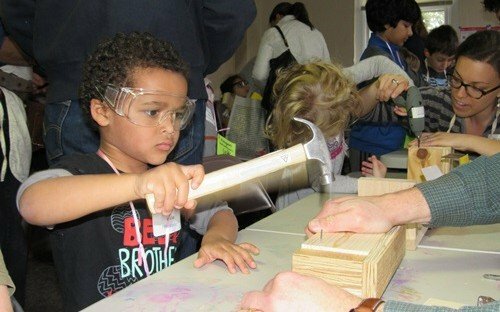 Did your child have a fun or useful experience at the fair? Share your comments below! Children aren’t the only ones who find fun and satisfaction at the Can Do Kids Fair! Parents are often delighted and amazed to discover what tasks their children are capable of. And as a volunteer of many years at this event, I get an inestimable charge seeing the gratified and confident young faces who have just acquired new skills.